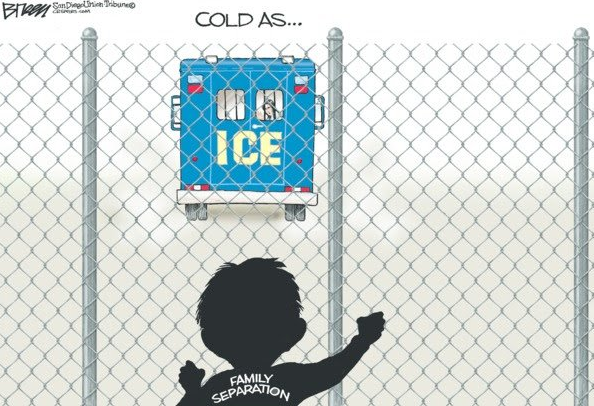 The stories of innocent children being punished by traumatizing them with separation from their parents in a foreign country where they know no one in order to "deter" others from coming to the US is horrific. The country is finally waking up to it although I'm still not sure how many people actually think immigrants, even babies, have human rights anymore. The daughter of a Los Angeles man who was detained Sunday outside his home by U.S. Immigration and Customs Enforcement agents spoke out this week about his treatment and the immigration policies that appear to target longtime, law-abiding residents. Jose Luis Garcia, 62, was watering his lawn and having his morning coffee outside his home in the Arleta neighborhood of San Fernando Valley when ICE agents put him in handcuffs and detained him, according to his daughter, Natalie Garcia. The arrest came as a shock to the 32-year-old Garcia, who said that her father is a law-abiding, legal permanent resident who came to the United States nearly 50 years ago when he was 13 years old. He attended Van Nuys High School, and raised his family in Glendale, she said. Garcia said she was woken up at about 7 a.m. Sunday by the sound of her father yelling her name. She initially thought he was experiencing a medical emergency, but when she came out of the house, she saw eight agents who she did not yet know were from ICE, arresting her father. Garcia tried to get more information and asked to see the arrest warrant and if they had read him his rights. She said the agents responded rudely, did not answer most of her questions, and told her they did not have to show her the warrant. They told her that it was not a criminal warrant, but an administrative one. After the agents had left with her father, it was only then that she saw the coffee cup that he had dropped when he was being arrested. She then looked down at the card the agents had given her and finally realized the agents were from ICE. “I dropped to the floor in shock, because I didn’t ever expect this,” Garcia said. Garcia said that she had followed news about the arrests of immigrants who were in the country illegally, but it had not occurred to her that something similar could happen to her own family. “That’s why I urge people to look into your rights and get citizenship if you are able to,” she said. Garcia said her father has a conviction for a misdemeanor stemming from a domestic violence dispute with her mother that occurred 18 years ago. Her father completed his sentence for that conviction, which was anger management classes and reporting to probation, she said. ICE officials confirmed in a statement that Garcia, who is a citizen of Mexico, was arrested by deportation officers on Sunday. You can't beat the irony of ICE deporting someone who committed domestic violence 20 years ago in the same week that the ttorney general unilaterally ruled that women cannot seek asylum in the country if they are fleeing domestic violence. This is a campaign of terror being waged by the government against a specific community in the United States. There's no other way to describe it.